This is the Tick Tack Toe/ Naughts and Crosses Captcha, designed to be a fun and easy way of ensuring that only humans interact with your Dolphin (Boonex) website. 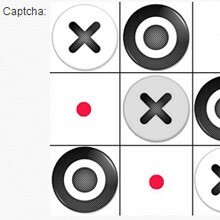 Your website visitors and members are presented with a super-quick game as an excellent alternative to text-based captchas. Just like the normal game, your visitor/ member is asked to complete the game by moving the X into the correct position to get the 3 Xs in a row. Once the game is won, the submit button is clicked and the content is unlocked, just like any other captcha. This Tick Tack Toe/ Naughts and Crosses Captcha utilizes an image-based interface to ensure full security of the actual installation. This module is compatible with Dolphin 7.1.x - 7.3.x (any subversion). This is yet again another fine example of Andrew's ability to create something amazing. Installation is really quick and easy, and this Tick Tack Toe captcha works exactly like it should - a great alternative to Re-Captcha. Nice provider, we work with andrew , because we know we 'll always have entire satisfaction with him. His mods are interesting and they work perfectly for our website! Mine doesn't work. I touch the red dots, and nothing. Works great! Thanks Andrew P, you are my PHP hero!